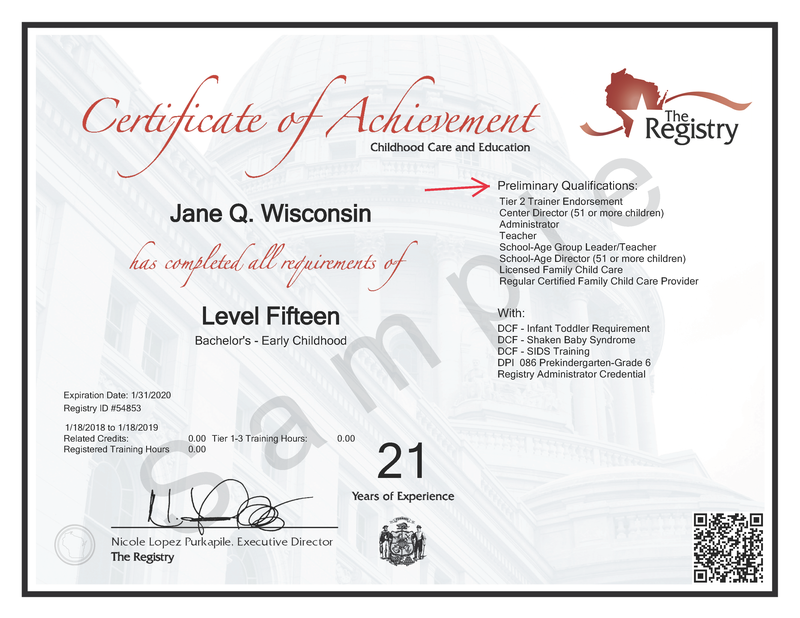 The Registry is updating language regarding the listed qualifications on the Certificate of Achievement to better align with licensing regulations and qualifications of positions. The heading on the right side of the certificate will be updated from “Qualified For” to “Preliminary Qualifications” (please see the sample certificate below). Historically, The Registry has qualified our members for positions based on education and/or training, which was always deemed preliminary. The language change better reflects our role with the early childhood and afterschool communities and stakeholders. To better understand all of the features of the Registry Certificate of Achievement, please view the online guide. This is helpful for understanding the listed content on the Registry Certificate of Achievement, which includes: Registry Career Level, special endorsements and training, preliminary qualifications, and years of experience. This update to the Registry Certificate of Achievement will be implemented on February 4, 2019. Please feel free to contact The Registry for assistance regarding this update.